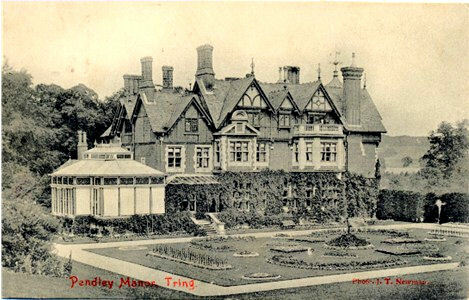 The manor of Pendley has been used as an example of the kind of information about manors that is given in the Victoria County History of Hertfordshire, in this case in the parish of Tring.. 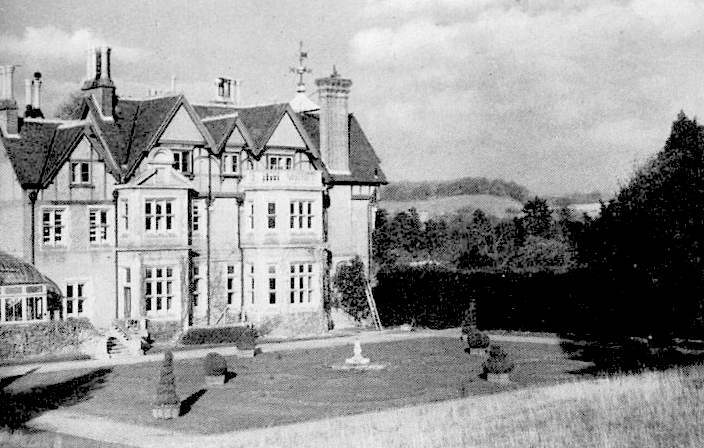 The manor of PENDLEY (Penley, Pendele, or Pentlai) was held as of the honour of Berkhampstead for a knight's fee. In the time of King Edward the Confessor it was held of Engelric by Eddeva a nun, and she could not give it away. After the Conquest it was given to the count of Mortain, and included the seven hides which the count took out of Tring. 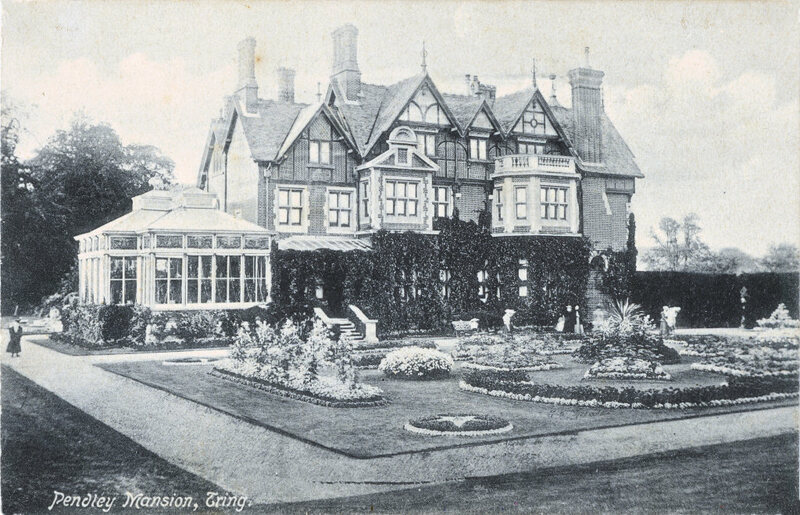 The manor was held at the beginning of the thirteenth century by William de Bocland, to whom it may have come through his marriage with Maud, daughter of William de Say. William died leaving as his heirs three daughters, Maud wife of William de Averanges, Hawisia wife of John de Bovill, and Joan wife of Robert de Ferrers. On a partition of his manors in 1218-3 the manor of Pendley was assigned to John de Bovill and Hawisia. Towards the middle of the thirteenth century this manor apparently had come into the possession of Roger son of John de Messeworthe, who before 1290 had alienated it to Adam Aignel. From John son of Adam Aignel the manor descended to his great-grand-son John son of William Aignel, who died in 1361, leaving a son John an infant. His widow Katherine afterwards married Andrew de Bures, and she and her husband occupied the manor during the minority of the heir. While still a minor John married the daughter of Sir John de la Hay. John Aignel held the manor in 1378, and granted a rent from it in 1385-6 to Thomas Peyure. 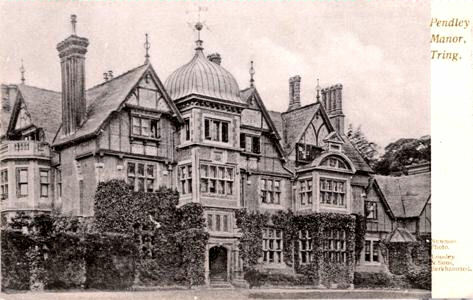 Chauncy states that Sir John de la Hay held a court for this manor in 1375-6, and that he probably left as his heirs two daughters, Alice wife of Robert Whittingham, and Joan wife of Walter Pain, for a court was held for the manor in their names 1401-2. Joan afterwards seems to have married John Impey, for in 1405 John Impey and Joan his wife settled half the manor on themselves and their daughter Joan and her heirs, with remainder in default to Richard Pain and his sisters Isabel and Eleanor, doubtless children of Joan by her first husband. A further conveyance was made by them in 1414 to Walter Salford and others. In consequence of these conveyances an action was brought against John and Joan by Robert Whittingham, who claimed the whole manor. The result of the plea is not gives, but it would seem that Robert made good his claim, for Robert son of Robert and Alice held courts for the manor in the reigns of Henry V and Henry VI. In 1440 Robert Whittingham and Agnes his wife had a grant of free warren in their manor of Pendley, and licence to inclose 200 acres in the parish for a free park. Sir Robert Whittingham was attainted on the accession of Edward IV for adhering to Henry VI, and Pendley was granted in 1461 to George, bishop of Exeter, the king's kinsman, for life. In the same year it was granted for life to Thomas Montgomery, but in 1467 the fee apparently was granted to Henry Bourchier, Lord Cromwell, and his heirs male. In 1469, however, it was granted to George, archbishop of York, and his heirs and assigns. There are no old court rolls and no courts are held. 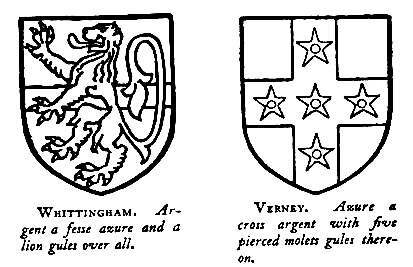 In 1506 it was stated that about eighty years before, Pendley was 'a great town, whereof part lay in the parish of Tring and part in the parish of Aldbury. The part in the parish of Tring was held of the archbishop of Canterbury as of his manor of Tring and the part in the parish of Aldbury of the manor of Aldbury, At that time there was no great mansion-house there, but there were in the town above thirteen plows besides divers handicraft men, as tailors, shoemakers and cardmakers with divers others. The town was afterwards cast down and laid to pasture by Sir Robert Whittingham, who built the said place at the west end there as the town sometimes stood, for the town was in the east and south part of the same place,' From further proceedings it seems that Sir Robert Whittingham also ploughed up a common way and in 1491-2 vestiges of the hedges still remained. There is a chapter on Dorien Williams (1914-1985) and his connection with Pendley in Tring Personalities and a chapter on Sir Francis Verney (1584-1615) in Further Tring Personalities. There are two pages on Pendley in the book A Hertfordshire Valley. Dorien Williams has written a number of books with autobiographical information on his association with the place, including Pendley and a Pack of Hounds (Hodder & Stoughton, 1959) and Between the Lines: Further Reminiscences (Methuen, 1984). The latest is A Perspective on Pendley, written by Bob Little in 2014.